I will be participating in the fifth and final One World One Heart event; this allows bloggers from all over the world to mingle, meet, and make new connections. It runs from January 30, 2011 to February 11, 2011. I you are a blogger too, why don’t you join in? Follow the link above for instructions! As part of this, there will be a door prize! I have not decided yet what to put – perhaps earrings, perhaps a “European Charm” bead, or most likely a pendant on a ribbon. I know! A charm bead pendant on a ribbon! If anybody has any favorites or suggestions, please leave a comment in this post. Thank you! For years I’ve taken pictures of my cars whenever I could. It was easy when on vacation because I when traveling I always had a camera at the ready. In the past, I did not carry a camera every day, but now I do! So, now I have even more pictures of my cars. 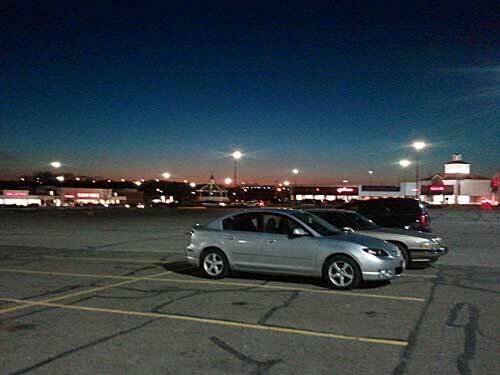 Here is a lovely composition I call Walmart Sunset. The silver car is mine – the others were just parking lot friends of my car. The photo was taken in the parking lot of the local Walmart (great title, huh?). Aside from sentimental value (ah, remember the time we went to Walmart…) I think the photos can be great inspiration for my glasswork. I would love to capture the fading from one color to the next. I like how the lights points have the star effect – I wonder how to use that effect? 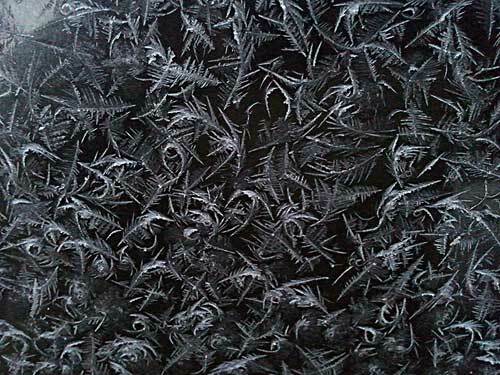 Here is frost that was on my black car yesterday. 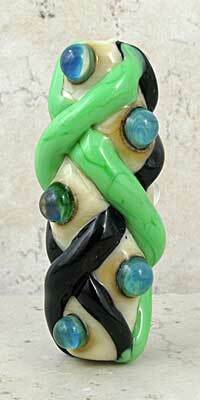 I’d need some wicked stringer control to make a bead like this. For non glass people, a stringer is a very fine thread of glass that is used to effectively paint on the glass; it takes lots of practice and a steady hand to control. I have many MANY pictures of my cars – in store parking lots, highway rest areas, national parks. Looking at them makes me very happy, maybe because they are inspirational, maybe because they bring back memories, or maybe because they are just silly. Second Try on the Yellow Bead – It Worked! 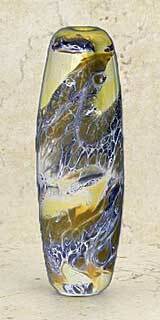 I tried the yellow and beige lampwork bead again. It matched my vision much better than my first attempt. Rosemarie Hanus makes usable beads too in her home studio. See these beads at Etsy, Art Fire, or her Spawn of Flame website. Here is one of my beads from the online Finding Your Voice Workshop. 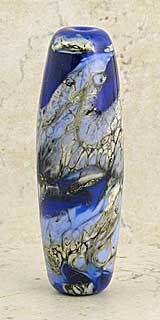 It is a lampwork glass bead that, well, the concept is great, but the bead is probably one of the ugliest bead that I have ever made. I have seen others make this claim, and when I see the bead, I think that the bead is just fine. You be the judge here. The assignment was to take a photograph of a bead that we make often and have good familiarity with it. In a photo editing program, we were to invert the colors and then actually make the resulting bead. When I did this, I discovered that I have already made a lot of these combinations already. I did find one to try – a blue bead that inverted into a nice yellow bead. So here are the two bead photos. The blue one is the original bead. The second is inverted – I left the background untouched (because I can). “Wow!”, I thought to myself – this will be great. Here is the result. I am almost embarrassed to post the picture of the bead, but I don’t think that viewing it will cause you permanent damage. 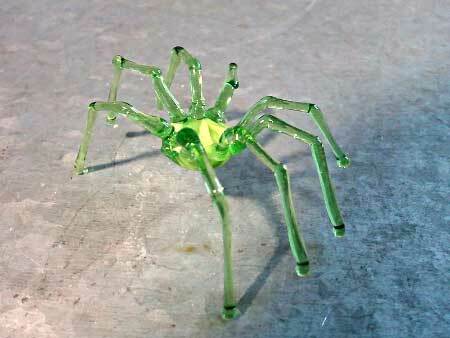 It also might give you a little insight into a lampworker’s not so successful experiments! The effect that I was trying to achieve was a soft yellow base, with accents of a darker yellow and brown. My choice of glass colors not play well together and made mostly mud. The shape however, is impeccable. What do you think? Could this be one of the ugliest beads ever? I continued making some more cable beads, and I thought that it would be interesting to add some dots in between the cables on my cable beads. These dots are made from a special glass that contains a lot of silver. When worked with a flame that does not have a lot of oxygen in the mix (called a reducing flame), it makes a very pretty, varied pattern. I put some clear dots on top to magnify the effect. I really like this! What do you think? Am I going in a good direction?